Dryfruit Thaali’s: Dryfurits are now available for gifting in festive packaging , like in designer cane thaali’s or silver thaali’s. There are variety of dryfruits like almonds, cashwes, hazelnuts, and lots more available in varied quantities and packaged neatly and kept in these festive thaali’s. Dryfruit Dates : Dates are a much healthier option for gifting during the festive season. Dryfruit dates come in many assorted flavors like Tamar Arabica – coffee flavoured crushed dates roll. Tamar Khaleeji Omani – dates with dryfruits , Tamar crunch – dates and roasted nuts and many more. You can send dryfruit dates to the health conscious or elderly people. 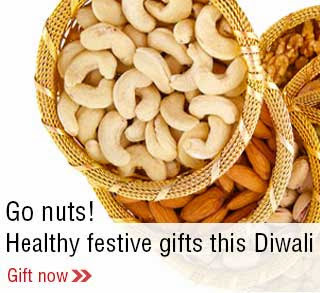 Silver dryfruit hampers : Diwali being a season for gifting , people always look for more and better options for gifting. The price and quality always matters when you are gifting loved ones. If you want to opt for gifting dryfruits then we have a great option of gifting silver plated bowls or containers with dryfruits in them . This becomes a hamper in itself and makes a perfect gift for loved ones. Sugarfree delight : When deciding to gift healthy gifts, how can we leave behind sugarfree sweets and chocolates ? There are many people who love having sweets but due to many health issues cant have, how about sending them sugarfree sweets and chocolates?